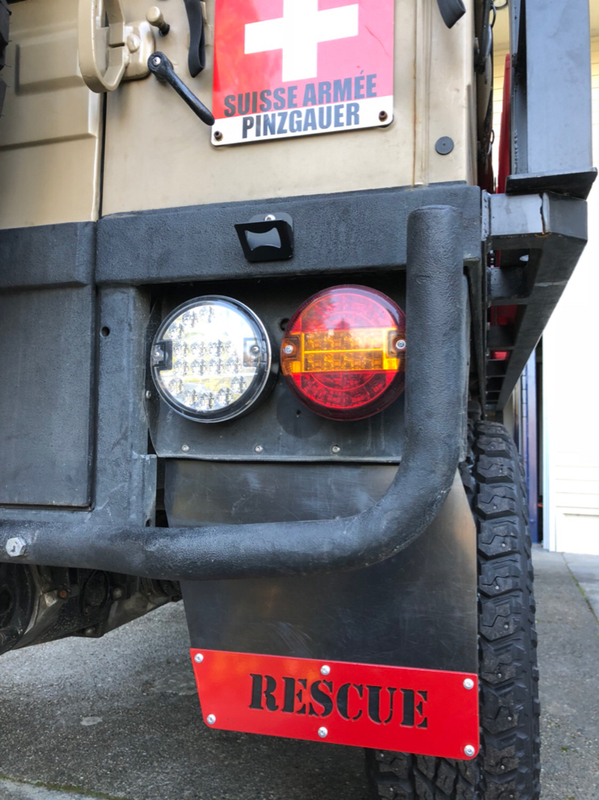 1972 Search & Rescue Pinz (*warning* picture heavy) - Page 4 - THE PORTAL HUB - Pinzgauers, Haflingers, Volvo 303s and more! 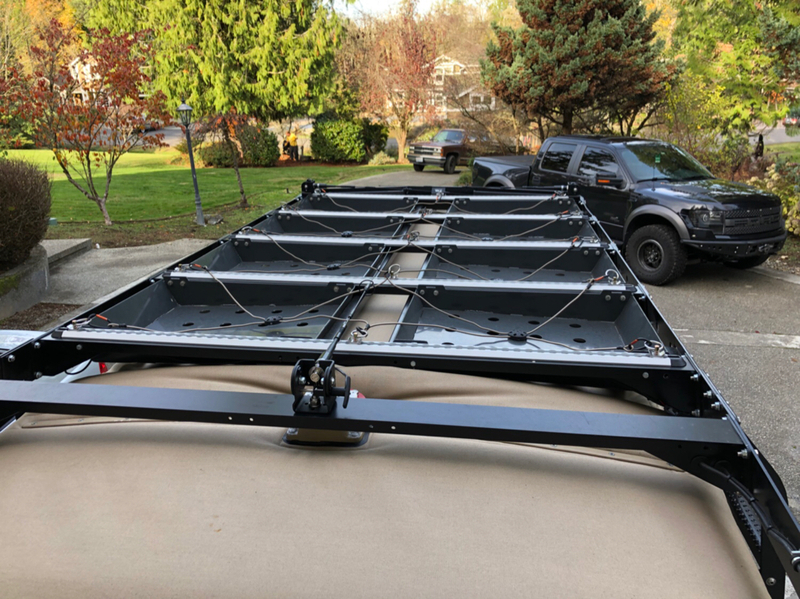 I added L-track to the cross members on my roof rack, added webbing to hold SAR packs in place, and mounted my antennas on quick release brackets that allow me to fold them down when not in use. 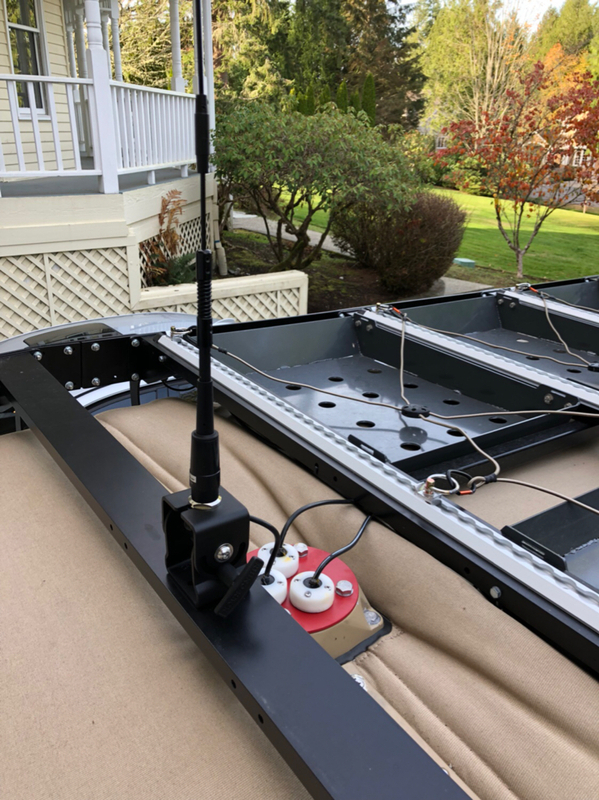 I added a cap for the stock antenna mount and used some blue sea systems grommets to run my antenna cable into my radio console. I also moved my seat belts in the rear to L-track and mounted some track on the floor to provide tie down points for cargo management. I’ll get some pictures of those later and post them up. Latest round of projects finished. Swapped the mud flaps out for custom shortened UHMW flaps and added another splash of red to carry the theme. Also flush mounted a KC HiLiTES cyclone LED in the spare tire as a third brake light. I still need to wire it in to the brake circuit. 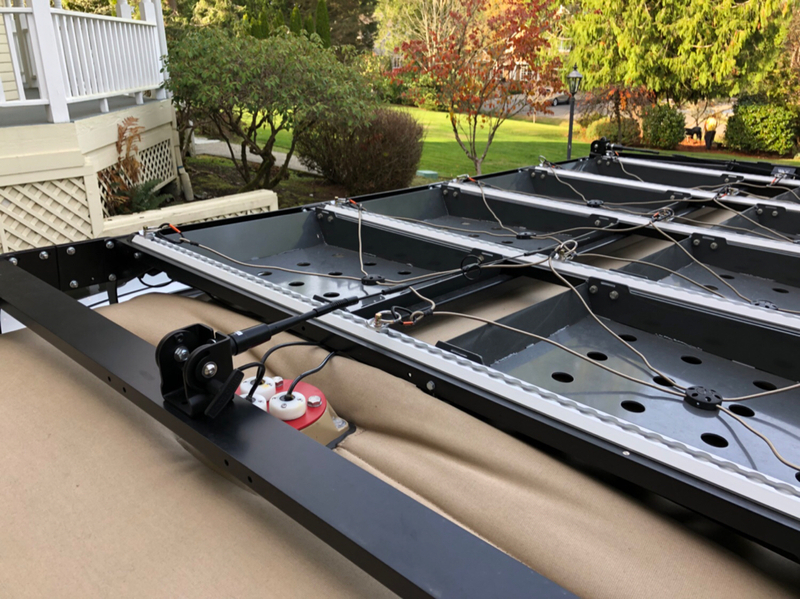 And switched the pintle hitch out for a standard receiver hitch and inserted a Carr folding step that flips down for easier access to the rear. 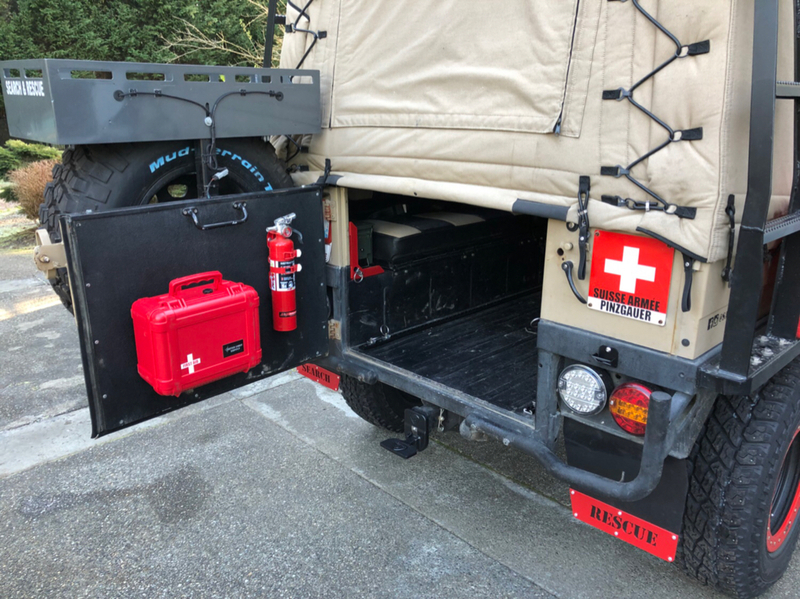 Mounted the Outer Limit Supply First aid kit to the rear door for easy access and moved my fire extinguisher to the door. You can see the flip down step in this shot. Added additional bracing to the rear panels to help tighten things up. 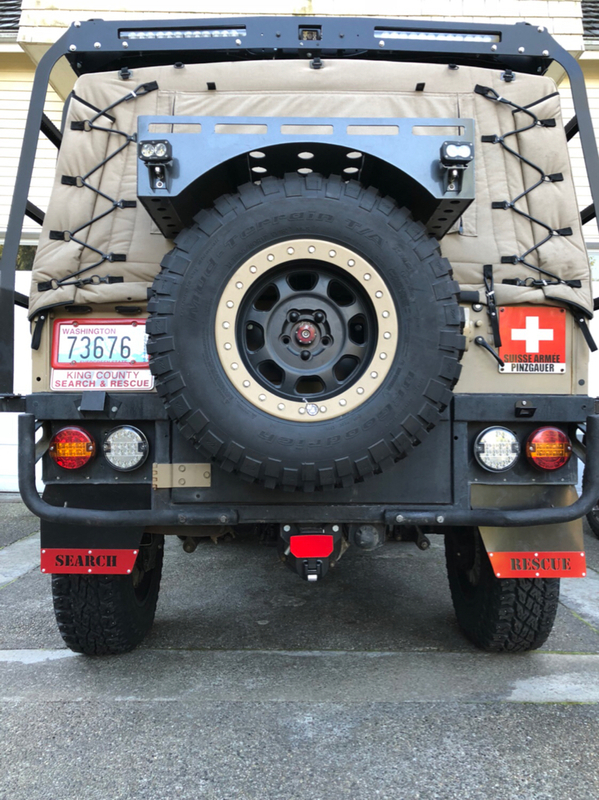 Joe at Mule Expedition Outfitters came up with the awesome idea to cut in the L-track style groove so I could add tie down points up higher as well. They work great! If you’re interested in a set call and talk to Joe, he has the files saved and can easily cut and bend a set up for you. 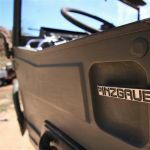 He shaped them to clear my @swagoffroad ammo can mounts so I didn’t lose any functionality. In the spirit of the old Saint Bernard Rescue dog I added an important feature to the Pinz, a bottle opener. 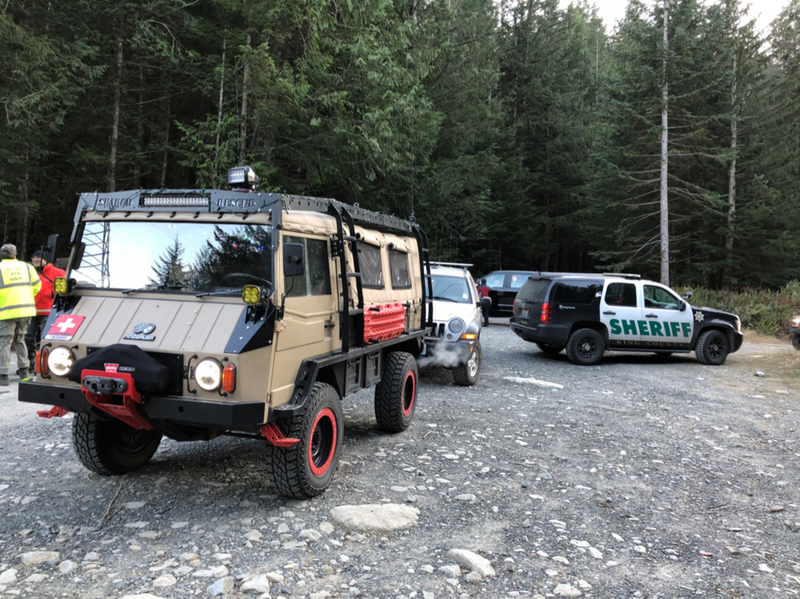 Just as I was wrapping up some projects today the call came out for a mission so headed straight up to the pass and had the chance to give the latest round of changes a shakedown. Overall it was a good day. Tomorrow a group of us are headed up for a Christmas tree run. Those tires look a hell of a lot more functional than the fat ones you had. VinceAtReal4x4s wrote: Those tires look a hell of a lot more functional than the fat ones you had. They fit and work much, much better. The others were definitely too big. The Coopers have been outstanding on snow so far. Really pleased with them. There was also a 1.5 inch spacer lift added to the front end when the new tires were installed - so that might make the tires look a bit smaller. I agree that these are a better fit - not as many narrow tires for 17 inch wheels and then these Trail Ready beadlocks are 8.5" wide too. 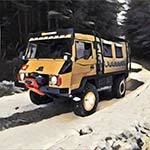 I'll do a write up on how this was lifted soon - I've done it on my Pinz as well and it is very easy and cheap and seems to work well for those with heavy bumpers and/or winches. Chris’ spacer solutions was simple and brilliant. Leveled the Pinz out nicely. It’s been fantastic living fairly close to someone who has his experience and passion for these machines. Why did you need extra bracing in the rear? GadgetPhreak wrote: Chris’ spacer solutions was simple and brilliant. Leveled the Pinz out nicely. It’s been fantastic living fairly close to someone who has his experience and passion for these machines. I used schedule 40 pipe to make my spacers. Simple and can be cut to the exact length needed for a perfect fit. First time I have ever heard of a failure. Any photos? 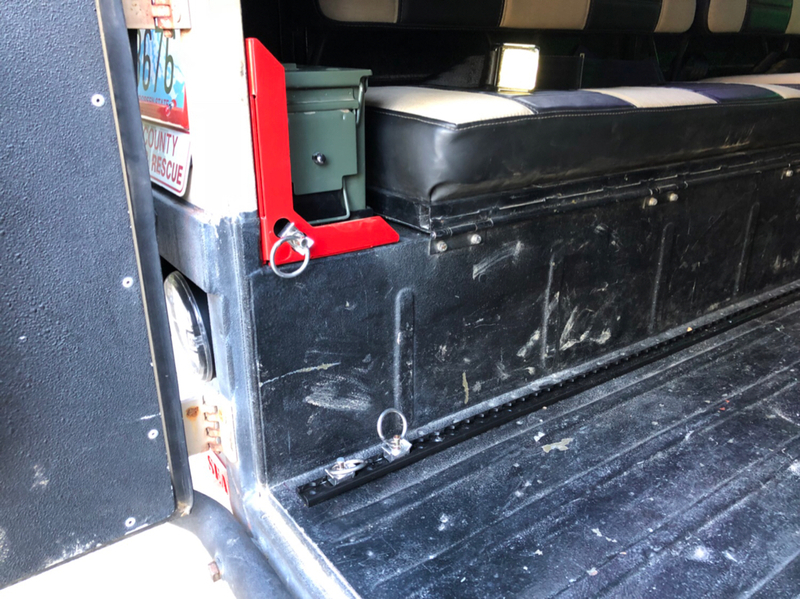 Long ago I took all the stuff off the door, my Jeep experience taught me that the rear door is no place to hang things. I have seen other body points fail but not the rear panels, well except from rust.